One of the best things about a low-carb diet is that it is typically higher in protein and fat, meaning that you can still enjoy things like beef, chicken, and turkey without feeling any guilt. However, when it comes to dressing the meats, you can entirely undermine your diet with something as simple as gravy. Why? Because, with each tablespoon of flour you use to thicken the sauce, you will be adding no less than 6 grams of carbs to the dish. The same applies to alternative thickeners like cornstarch and arrowroot which add 7 grams per tablespoon. Even popular, gluten-free options like rice flour add 8 grams per tablespoon, puncturing the commonly held belief that gluten-free = low carb. Vegetable gums like xanthan gum and guar gum have absolutely no carbs and contribute much-needed fiber. Xanthan and guar gum are used in many packaged foods, like ice cream, to give them a mouth-clinging sensation. 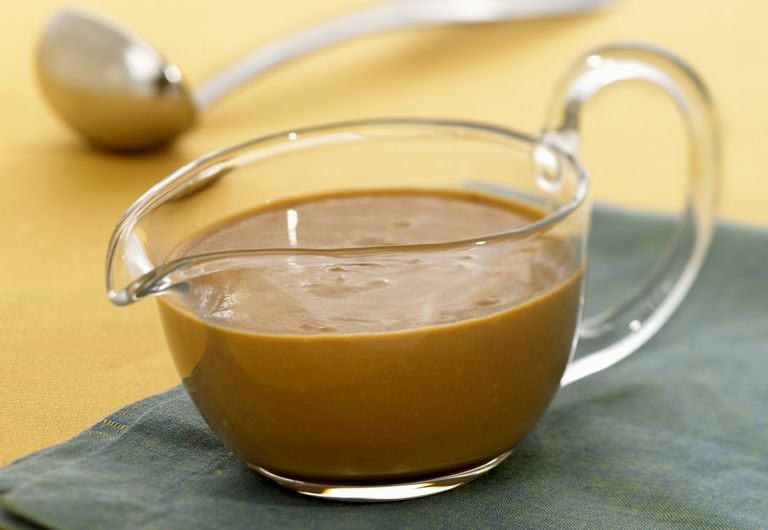 When used for gravy, you need to avoid adding too much, or your gravy will end up like slime. One good way to avoid this is to use a proprietary product, like Dixie Diner's Thick it Up, which contains xanthan or guar gum but provides greater control of the thickening process. Reduced cream or half-and-half is a nice choice for making a chicken or turkey gravy. To do so, add three or four tablespoons for each cup of stock and cook down for several minutes over a medium-high heat. Doing so reduces the water content and allows the cream to thicken ever slightly. Again, don't add to much cream or you will entirely drown out the poultry flavor. Cream cheese is low in carbs and can be used alongside reduced cream or half-in-half to create a more country-style gravy. To round out the flavor even more, add a teaspoon or so of Worcestershire sauce a the end and cook for an additional minute or two. Drippings are what's left on the bottom of the pan when you're done roasting a piece of meat. They include fats, juices that have seeped from the meat, and the sticky caramelized goo which contains most of the flavor. To create an entirely carb-free gravy, don't add ingredients to thicken the sauce; instead, thicken the sauce by reducing the liquid. This classic "au jus" approach may not have the thickness we love in a gravy but will have a more intense flavor with only a tablespoon or so of sauce. Remove the meat and vegetables from the roasting pan. Strain the juices into a bowl and skim off the fat. Place your roasting pan on the stove over a low heat and add a few tablespoons of the juices to start melting the caramelized goo. Keep adding the juices until all of the caramelized goo has dissolved. If you don't have enough liquid, you can add a little canned stock (ideally salt-free). Taste the sauce. If it is salty enough, stop cooking and remove from the heat. If you reduce the sauce any further, it will be too salty. If you want to give the sauce an extra finish, do what the French do and swirl in a pad or two cold butter off the heat. Keep swirling until the butter is completely melted. The added butter will give the sauce a slight gloss and a more rounded flavor. One tablespoon of butter contains practically no carb. If you need to reheat the sauce, do so gently. Do not boil.